Earthquake occurrence modeling is a rapidly developing research area. This book deals with its critical issues, ranging from theoretical advances to practical applications. 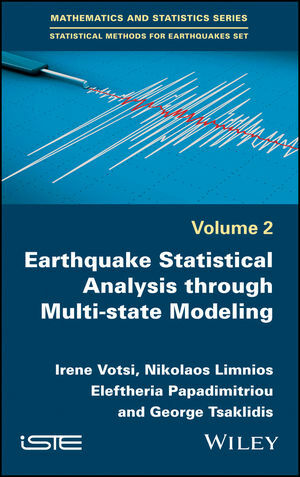 The introductory chapter outlines state-of-the-art earthquake modeling approaches based on stochastic models. Chapter 2 presents seismogenesis in association with the evolving stress field. Chapters 3 to 5 present earthquake occurrence modeling by means of hidden (semi-)Markov models and discuss associated characteristic measures and relative estimation aspects. Further comparisons, the most important results and our concluding remarks are provided in Chapters 6 and 7. Irene Votsi is Assistant Professor of Statistics at the Manceau Laboratory of Mathematics, Le Mans University, France. Nikolaos Limnios is Professor of Applied Mathematics at the University of Technology of Compiègne, Sorbonne University, France. Eleftheria Papadimitriou is Professor of Seismology at the Aristotle University of Thessaloniki, Greece. George Tsaklidis is Professor of Probability and Statistics at the Aristotle University of Thessaloniki, Greece.